For Martin Luther, God’s action in creation, redemption, sanctification, justification, and prayer are inseparably tied together, and all true prayer finds the seed around which it can crystallize in the Lord’s Prayer. Albrecht Peters’ Commentary on Luther’s Catechisms: Lord’s Prayer shows the development of Luther’s thoughts on the Lord’s Prayer and provides the needed context for Luther’s interpretation within that of the Western tradition. The following excerpt explores Luther’s thoughts on the Second Petition of the Lord’s Prayer. In the deepening comparison, the reformer underscores the transcendent-eternal dimension of the rule of God. We Christians dare to believe that the invisible, eternal creator God wishes to establish His imperishable kingdom here in this world of death of ours. In the first three Thy-Petitions, God preserves for us a portion of His heart’s desire. He allows us to see His innermost desire. Through this He elevates the minds of men and their prayers up above this life, which is so quickly devoured by death, to His unfading eternity. Luther only hints at that internal reorientation of our prayer in the Large Catechism. 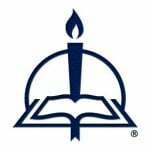 In the catechetical sermon of May 25, 1528, he had developed it more richly. Through God’s revelation of salvation something different has come about in the prayers of humanity. Where God makes His name known, reveals His will, and establishes His kingdom of grace among us, He opens His heart to us and through that makes it possible for the first time that we human beings may take the content of the Thy-petitions as our own. Friedrich Heiler has shown in his standard reference on prayer that people outside of the Biblical revelation know of a supreme being and honor the former as the all-sovereign power, as all-knowing holiness, and benevolent Father of all. Their petitions remain nevertheless in the horizon of creation and suffer under an unfathomable uncertainty. They request that “bread” in the comprehensive sense that Luther develops in the Fourth Petition, for the ordering and strengthening of the earthly life of their family or tribal society. They cry out under the fearful tyranny of those demons and ancestral spirits immediately oppressing them and risk themselves in single syllable cries of distress directed at the benevolent, but infinitely distant lord of all the living. In everything the view remains captivated by the concrete biological needs. for deliverance from sickness, guilt and death. This they all do, whether Christian or pagan. seeing him devoured by sins, weakness and death. Christians stand near God in His affliction. To the suffering of God in Christ corresponds however His promise that He by means of the resurrection of Jesus will overcome all the opposing powers. Still veiled under the cross of Jesus and only recognizable through hopeful confidence, He establishes out of Christ’s resurrection His kingdom among us, which seeks to destroy sin, death, and hell. Through the Gospel of Christ, the participation in that eschatological kingdom of God is promised to all people. In His monarchical honor, God bids us therefore to petition Him for that “eternal, abundant treasure” that He Himself has made accessible to us through the revelation of Christ. In his interpretation of Matt. 6:33 in the weekday sermon on the Sermon on the Mount, Luther fills the striving for the kingdom of God with the image of the righteousness of Christ. As Lord and King in God’s dominion, Jesus is the original image of the righteousness desired by God, into which we already here on earth in faith, love, and hope are conformed. As the One resurrected and ascended to the right hand of the Father, He is at the same time the target image toward which we extend ourselves when we request the future of the kingdom of God. Our trusting-hoping heart should extend itself toward this free breathing in the merciful sight of God, toward this complete pulsing through of God’s holy judicial will that has finally suppressed all the downward driving powers of death. In this petition it concerns no less than perfect fellowship with God “so that we receive God together with all His possessions.” This begins here in the daring of trust; this is completed there in the clear sight of God. For these “eternal and imperishable things” it is worthy to strive “in the first place.” Hereupon the sight of the individual Christian should and may unceasingly be directed. Where we stand under God and His kingdom of grace and are able to pray this petition genuinely, there the need that is common to Christian and non-Christian alike of our “foul, mortal kingdom of the stomach” is also rightly brought before God. Thereby the absolute priority is properly preserved of the Thy-petitions before and above the Our-petitions. We should guard ourselves against striving for the kingdom of God for the sake of those earthy “results” and not for its own sake. Whoever thinks he is able to strive for the kingdom of God so that the earth will be subject to him sins against the fundamental commandment of the Lord, to allow the need for God among us to be the Alpha and Omega of our prayer. Nevertheless the Lord seeks in both, in God’s work of creation and in Christ’s kingdom of grace, in His secular and in His spiritual government, one and the same thing concerning us. He seeks only that unhypocritical faith that “expects from God without doubting” the temporal as well as the eternal goods. Pagan and Christian are thus both the same, deeply connected with one another and profoundly different from each other. They are connected with one another in the ancient mystery that we do not have our lives in our hands, that we continually must suffer that unfathomable weakness in our freedom. They are thereby distinguished from one another in that, according to the reformer, true faith does not originate from the sovereign-hidden presence in the creation, but instead only out of the revelation of salvation of the merciful Father through the Son Jesus Christ in and with the Holy Spirit. Therefore the reformer in this petition for the kingdom of God sharpens both the promise and the commandment of God. The “eternally unfailing fount” of all life commands and encourages us to entreat Him for the highest thing that has not come into the heart of any man. From this we may obtain an unwavering certainty and joyousness. Dietrich Bonhoeffer, Widerstand und Ergebung (Munich: C. Kaiser, 1954), 246. BSLK, 678.7 (LC III 68). Bonhoeffer, Widerstand und Ergebung, 247. BSLK, 674.34 (LC III 55). BSLK, 676.3 (LC III 60). BSLK, 675.23 (LC III 58). “Wochenpredigt zu Matt. 6:33, 1530/32,” WA 32:467.21 (see also AE 21:203). BSLK, 675.15 (LC III 58). BSLK, 674.42 (LC III 56). Some footnotes from this selection have been omitted. From Commentary on Luther’s Catechisms: Lord’s Prayer, pages 86–90. English translation © 2011 Concordia Publishing House. All rights reserved. 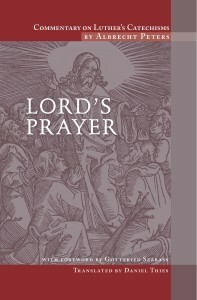 To order Lord’s Prayer, please contact CPH at 800-325-3040 or visit www.cph.org. Albrecht Peters’ Commentary on Luther’s Catechisms is a five-volume set. The other volumes are: Ten Commandments, Creed, Baptism & Lord’s Supper, and Confession and Christian Life.